I feel like a chicken tonight because I am nervous and scared about competing against others in contests. If the powers that be like my recipe below, I'll be on my way to an all-expenses paid trip to San Francisco to attend the 2nd Annual Foodblogger Festival in November. I'll be able to do a food demonstration and share my recipe with other festival-goers. I would love to have the opportunity to attend (for free)... I went last year (with a broken arm) but I was so sick the entire weekend that I did not get to participate in any of the festivities. I'd like to make up for that tenfold with a trip this year. 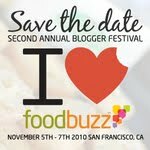 The Foodbuzz Tastemaker Program is a sampling program offered through Foodbuzz and Foodbuzz's brand partners. If you participate in the Tastemaker Program, you can receive a free sample or coupon for product. This time around, I received a coupon & purchased Nature's Pride Country White Bakery Buns as part of the Foodbuzz Tastemaker Program. Last year I was introduced to Nature's Pride through this same program. Now I seek out their bread products and I feel good that the bread is 100% natural and can be found in my local grocer. Speaking of fillings, the chicken and pumpkin filling is rich, creamy and seasonal. The sage lends an earthy twinge to the pumpkin and the bacon is a toothsome addition to the chicken. With a rolling pin, roll out each bun until thin. Oil small muffin tins and place the bread rounds (top side, down OR bottom side, down) inside. Bake until golden. Store the croustade shells covered in a dry area. Add pumpkin and heavy cream to a medium saucepot. Bring mixture to a simmer, mashing and stirring the pumpkin into the cream. Reduce cream by half and reserve until needed. Saute the chicken in 1 tablespoon oil until half cooked. 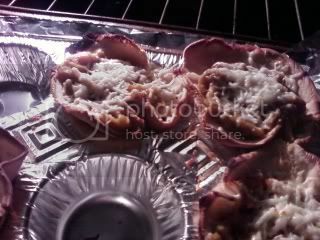 Add the bacon and continue to cook until is thoroughly heated and chicken is thoroughly cooked. Add the pumpkin cream and black pepper, to taste; bring to a simmer. Add a little hot cream to the egg yolk to temper and add to pot, being careful not to boil. Add the cheese and sage. Adjust seasoning. 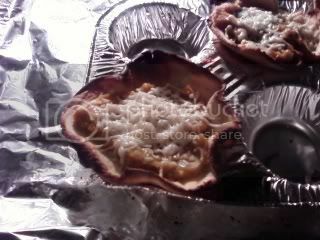 Fill the croustade shells; sprinkle with a little additional grated Parmesan and brown lightly under a broiler or salamander. Garnish with sage. Serve warm. E voila! 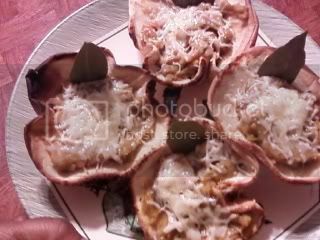 Chicken Pumpkin Croustades!